The perfect balance of luxury and price, Sweet Dreams is a Koh Rong Sanloem favorite. We only intended to stay at Sweet Dreams for one night, but we liked it so much that we extended our stay. Sweet Dreams offers the perfect balance of budget and luxury — their modern seaview bungalows are priced similarly to the much more basic wood-and-thatch offerings on the island but are built to a higher standard, with lots of little touches to make your stay more enjoyable. 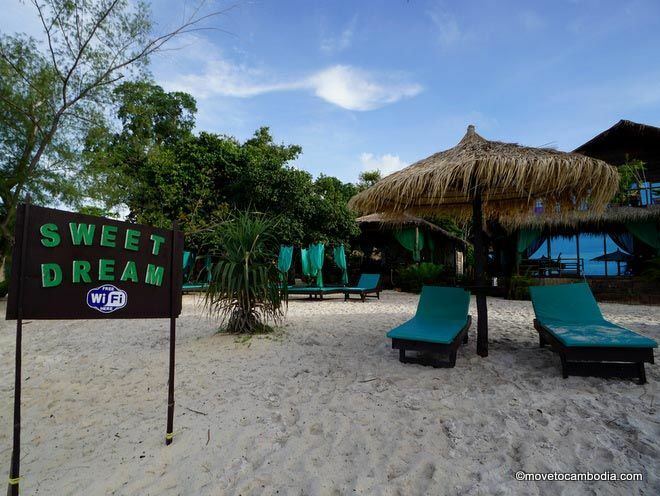 Sweet Dreams is one of Koh Rong Sanloem’s sweetest accommodations. There are several bungalow and room types at Sweet Dreams, some of which are quite difficult to differentiate. We stayed in a seaview bungalow with private balcony and were delighted to find out that in person they were much more impressive than they look in the photos on the resort’s web site. The bungalows have reflective glass sliding doors, which give you an unobstructed view of the turquoise waters of Saracen Bay without letting anyone else see you lying in bed in your skivvies staring at the sea. 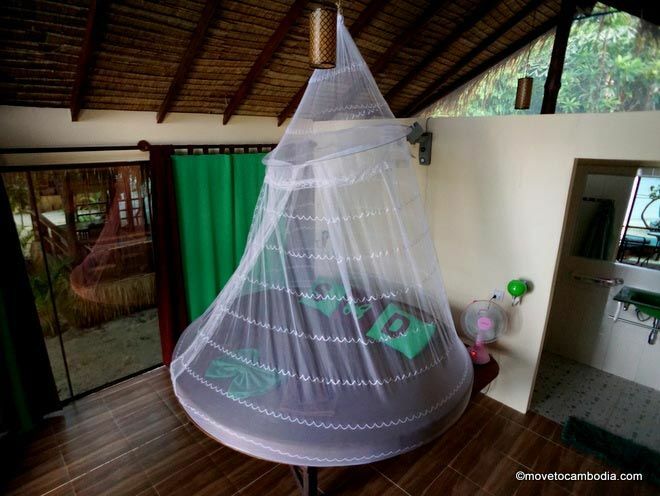 The beds are round, with a canopy-like white mosquito net. We’re not sure what it is about round beds, but there’s something about them that appeals to the romantic weekender in us. 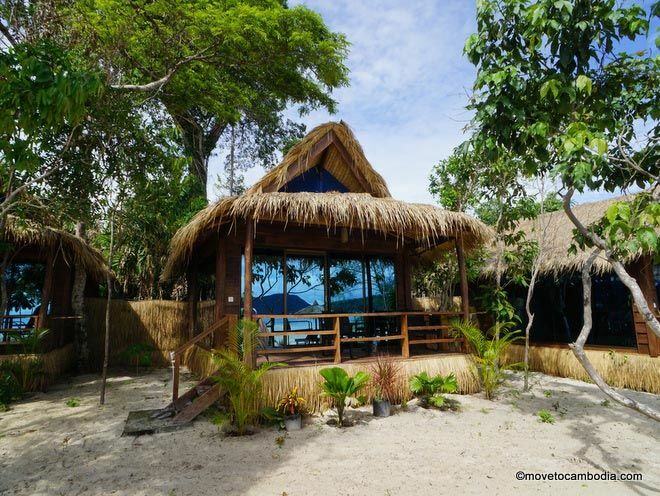 The seaview bungalows offer an unobstructed view of the ocean without letting anyone see in. 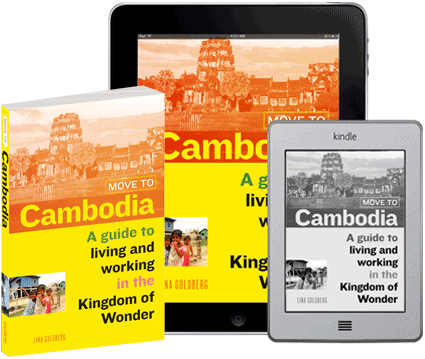 There are several bungalow types: standard, garden, seaview, and side sea-view. The seaview bungalows, also called waterfront bungalows ($50-75), are the nicest (pictured here) and directly face the water ( most have one double bed, but there’s also one with a double and a twin bed) while the standard ones are slightly older and less expensive. The side sea-view bungalows are in the second row so don’t have views that are as nice, and the garden-view bungalows are the same as the seaview bungalows but without the sea view. There is also a larger seaview bungalow that can sleep four. 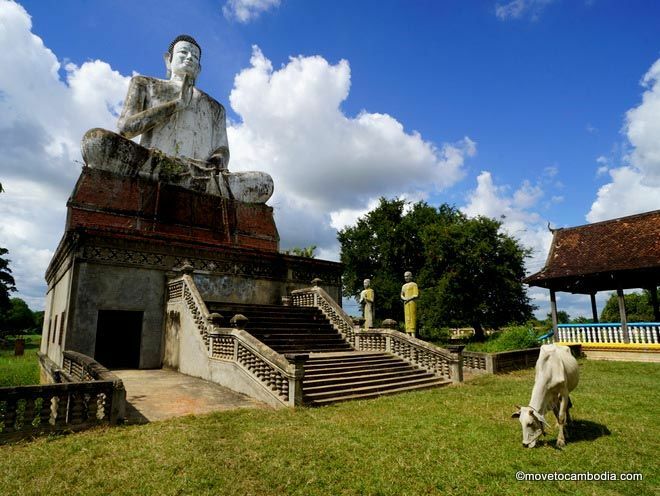 In addition, the resort offers several large rooms in an adjoining building facing the sea. There are family rooms with one king-size and one queen- size bed, and another room with a king-sized bed, also with sea views. Yes, the array of room and bungalow types are confusing! All of the details have been thought of, including a round bed. We appreciated the fact that Sweet Dreams provided a mosquito-zapping bat, a crucial tool in Cambodia, as well as a flashlight and umbrella for rainy season showers. Bungalows are fan cooled, and there are (screen-covered) vents at the top of the bungalows that allow air to circulate without letting insects in. After spending a week slumming it on Koh Rong, coming to Sweet Dreams was a relief because of the proper walls, bug-free bungalows, actual windows, and all-round attention to detail. Sweet Dreams has 24-hour electricity and WiFi is available at the beachside restaurant and the bungalows closest to it. They will also pick you up by boat at the pier at if you tell them in advance which Koh Rong Sanloem ferry you will be on, a nice added service that will save you walking 15 minutes down the beach with your luggage. Sweet Dreams even offers boat pickup at the pier so you don’t have to haul your luggage up the beach. Breakfast is included with most bookings, and they offer a range of reasonably priced choices of mostly European fare. The owners are from Ukraine and we were sorry to see there were no Ukrainian dishes on the menu — we hope they will add them in the future! The three young couples who started Sweet Dreams left Ukraine because of the war and started over on Koh Rong Sanloem, where they have built most of the bungalows and buildings themselves, and they’ve clearly put a lot of care into the project. This is one of our favorites on Koh Rong Sanloem. Bookings are available online. Prices seem to fluctuate (particularly in low season) and there are sometimes discounts available on Booking.com depending on your dates. 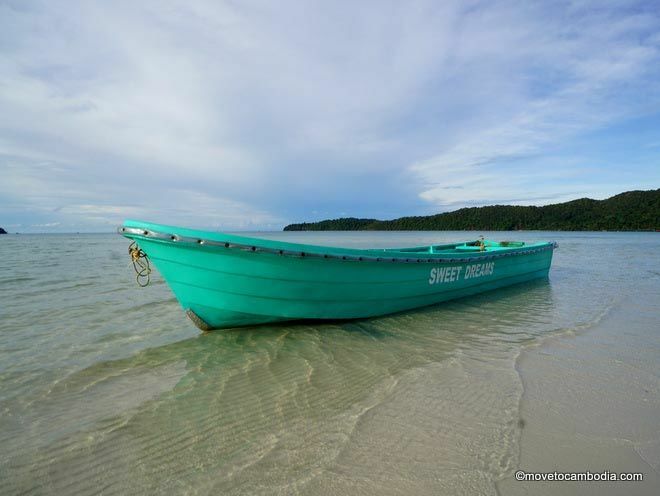 → Check prices and book a room at Sweet Dreams, Koh Rong Sanloem on Booking.com or Agoda now.